As a senior professional engineer with Environmental Design Group, I have the opportunity to engage in all aspects of project development and design, but I have to admit . . . I still get geeked-out about stormwater management and green infrastructure design. The role of plants as excellent pollutant removal agents still amazes me. They are a perfect fit to treat stormwater since they naturally break down oils and filter sediment. The reason we treat stormwater runoff is because of the pollutants it can acquire as it travels to its drainage site. As soon as it hits the ground and moves towards local collection systems, the water will pick up dirt, grease, oils and all kinds of things– things we don’t want in our streams, rivers and lakes. Once these undesirables have reached the waterways they are very difficult to remove. Utilizing plants in this way is really biomimicry at its best, not to mention they aren’t bad to look at. It’s because of the National Pollution Discharge Elimination System (N.P.D.E.S) that stormwater management is necessary in the first place. It’s a permit program that was created in 1972 by the Clean Water Act, for the capacity to authorize state governments to perform program aspects related to stormwater permitting, administration and enforcement. Its overarching requirement is that stormwater runoff generated from newly constructed or reconstructed areas should be treated by way of an approved Best Management Practice, or BMP. These BMP’s promote water quality and correspond to appropriate water quantity prior to discharge into waters receiving the runoff. 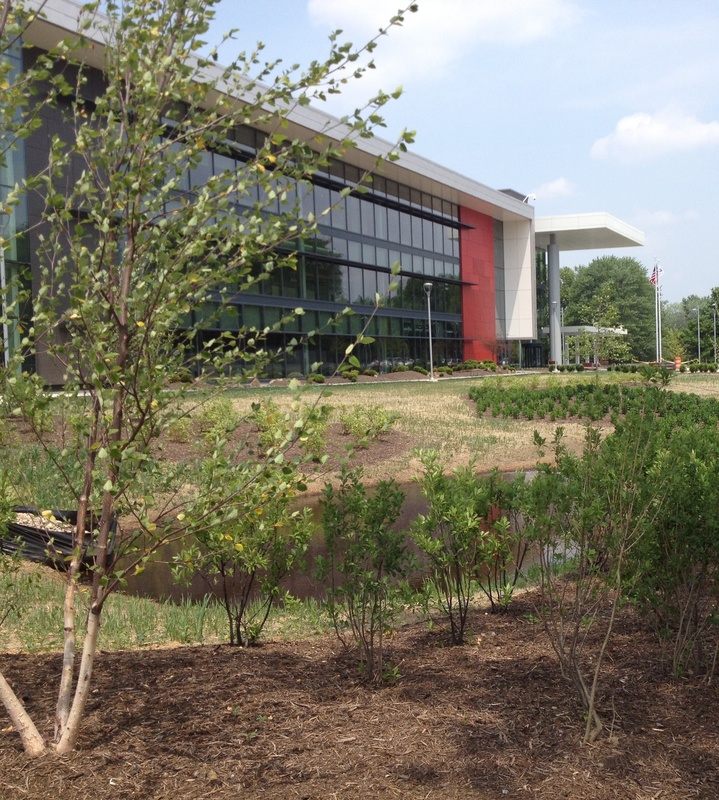 BMP’s range from detention basins to rain gardens, to pervious pavements to wetlands, and more. 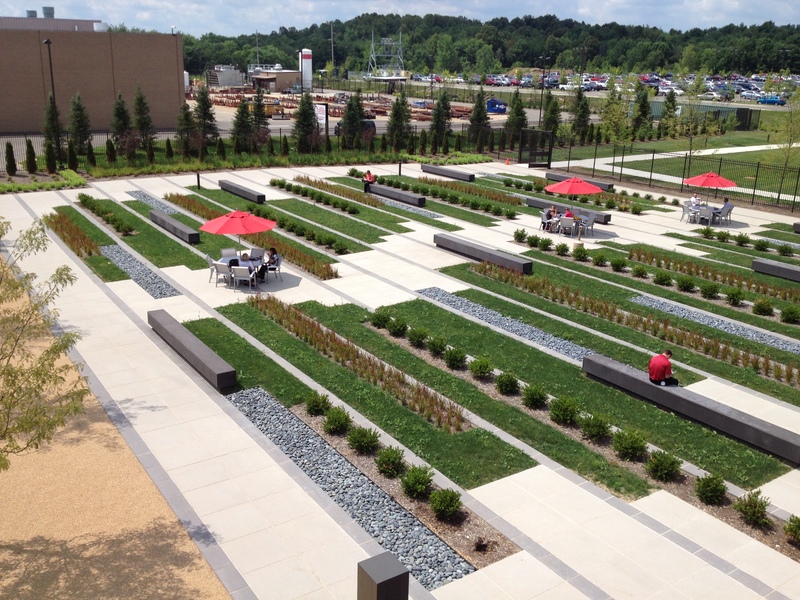 Changing a site’s landscape (as any designer knows) can dramatically increase the stormwater run-off, and managing that could prove challenging – especially in urban settings or when there are major site constraints such as topography or ownership boundaries. This is where I come in, to design practices to manage the stormwater on project sites. Finding solutions to these challenges are what I consider to be the exciting part of design. I am fortunate to work with a team of people who believe stormwater management is not merely a byproduct of development but should be publically celebrated on the site and within the landscape. 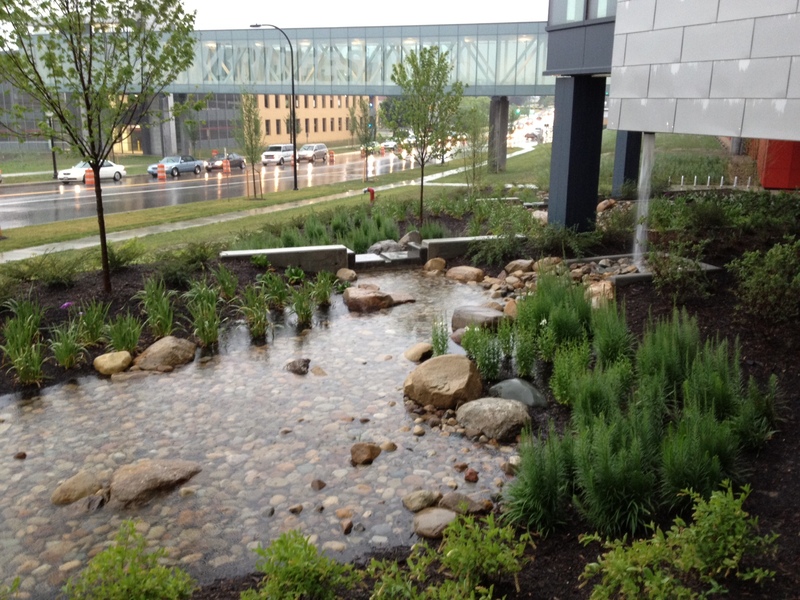 Stormwater green infrastructure is not only an effective form of management, but it also enriches the community. Integrated in the beginning of the design process and appropriately placed, the BMP’s become visual enhancements that serve multiple purposes including infrastructure, beautification, outreach, education and more. At Environmental Design Group, we have had the opportunity to work with many communities assisting in their stormwater management needs, from developing a municipal G.I. handbook to designing stormwater retrofits using green infrastructure. Many of these areas not only require infrastructure improvements but benefit from the capital dollars and attention to their neighborhoods. It is remarkable to see the transformation, not only of the community landscape, but the mindset of people who live and visit the areas where we have designed stormwater management strategies. It’s a great opportunity, from our perspective, to provide the community with positive impacts to the environment that also reinforces safety and a sense of pride in the communities we serve. This makes me so proud to say Jill is my daughter. Our family has always worked to make our environment a better place. Jill’s dad worked for over 40years with one abiding philosophy–to protect the parklands not only for the recreational and passive use of the people but to also protect these lands so that they can better function as nature’s ‘housecleaners’. I’m also happy that Jill is working with people who share this philosophy.